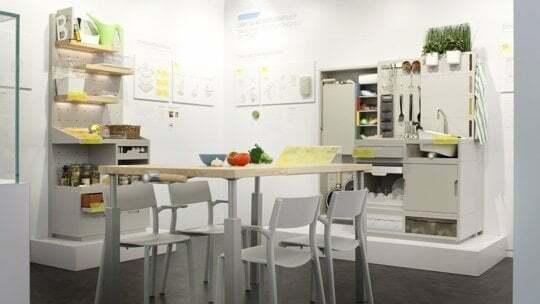 Shelves that double as a fridge and a smart table that cooks your food: Ikea has revealed its vision for the kitchen in 2025. Other concepts include food delivery by drone and recycling waste food whilst extracting usable water. 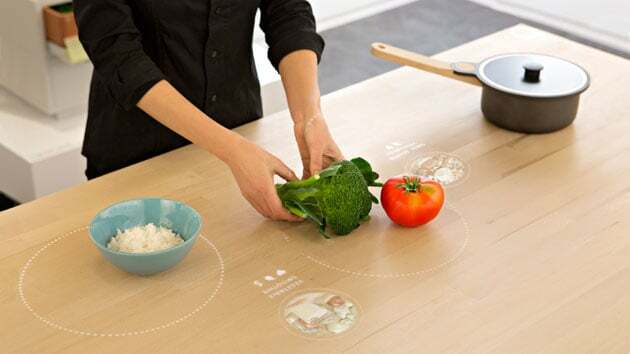 Imagine a smart kitchen table that can match the food you place on its surface to recipes suggestions. If you’ve missed out on ingredients, they can be delivered almost instantly by a drone – so long, weekly shop! The smart table concept involves a camera and projector above a table working as an interactive control centre. The table can tell you exactly what you should be cooking by sensing the food placed on its surface. Once you’re done cooking, food storage containers take the place of a refrigerator by keeping produce at exactly the right temperature on shelves. You can then stay green by using an in-kitchen composting system that compresses leftover food waste into dry, odourless packages with the extracted water used for indoor plants. Ikea are currently displaying a concept model of its design in Milan. The Swedish furniture giant have also revealed they will launch a range of desks, tables and lamps that can wirelessly charge mobile phones. The Home Spot range of desks, bedside tables and lamps will hit Europe and North America next month – with an international roll-out set to follow.